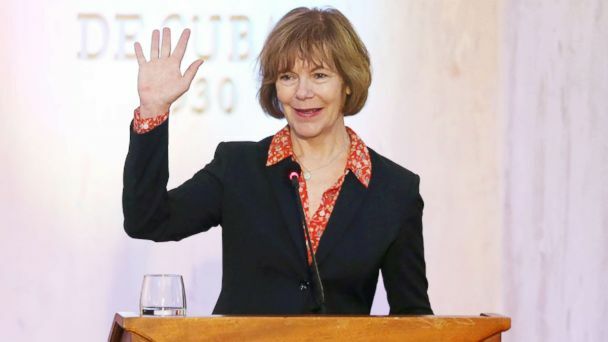 There are a record number of women serving in the U.S. Senate now that Democrat Tina Smith, the former lieutenant governor of Minnesota, has been sworn in as a U.S. senator representing that state. Smith's addition to the Senate brings the total number of female senators to 22, according to Rutgers University's Center for American Women and Politics. There are 17 Democrats and five Republicans who make up the women serving in the Senate. While today also marks the highest number of women serving in Congress overall, women still make up less than 20 percent of Congress. "It's is an important historical note but it's also an important reminder of how far we still have to get to parity for women in American politics, particularly on the congressional level," Rutgers political science professor Kelly Dittmar, who's also a scholar at the Center for American Women and Politics, said. With Democrats Smith and Sen. Amy Klobuchar as the two senators from Minnesota, the Midwest state joins three other states represented by an all-female Senate delegation. California, New Hampshire and Washington are the three other states now with two female senators. Only six states in the history of the Senate have had two female senators at the same time, with California being the first in 1993. But Klobuchar still remains the only woman Minnesotans have elected to the Senate. Smith replaced former Sen. Al Franken, also a Democrat, who stepped down from his seat last month amid sexual misconduct allegations and a Senate Ethics Committee investigation. Vice President Mike Pence swore in Smith this afternoon at the U.S. Capitol. A week after Franken's Dec. 7 announcement that he would resign from the Senate, Smith was tapped by Minnesota Gov. Mark Dayton, also a Democrat, to head to Washington. Franken left the Senate Tuesday. Smith was already in Washington the week leading up to Christmas, participating in meetings. Smith's time in the Senate, however, may be temporary. She'll serve until the winner of the November special election permanently replaces Franken. Her last day will be in January 2019, but Smith said she intends to run in the special election. The Center for American Women and Politics has also been tracking potential female candidates in the upcoming midterm elections. A record number of female candidates are expected to run in 2018 across all levels of office, professor Dittmar said, but particularly in Congress. Forty-six candidates are expected to run in the midterms for U.S. Senate, according to the center's research. In the lead up to Election Day 2018, however, women make up less than one-quarter the number of all potential candidates. The more women there are in Congress and the greater the differences among them, "it will add more diversity to the agenda and to the conversation," Dittmar said, adding that female senators' life experiences differ from their male colleagues. She pointed to the female congressional members who led the push against sexual assault in the military, sexual harassment on Capitol Hill, and the calls for Franken to step down as some examples of where women have made a difference. Female congressional members are "raising issues that previously didn't get the light of day," Sen. Kirsten Gillibrand, D-N.Y., argued in an interview for the Center for American Women and Politics' report published last year on the effects of having women in the U.S. Congress. "Now there is a woman, at least one, on every Senate committee, and I think that's helping," Sen. Susan Collins, R-Maine, told the Center for American Women and Politics. "Again, not because we think alike, but women bring different perspectives, different life experiences, and that's very healthy for an informed debate on issues."